Lord Buddha was full of Love, Ton’s of Love, Oceans of Love, Universal Love, Divine Love, unworldly Love, It was so wonderful that ignorance gets washed away in the flow of this Love. Love and knowledge are one and the same. Those who possess subtle mind and quality of goodness, Love everybody. 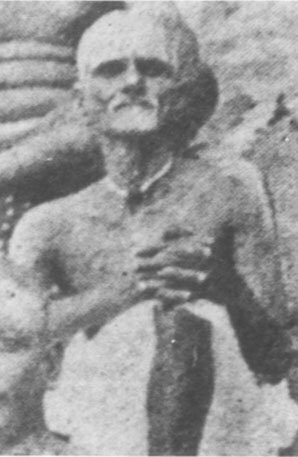 Nannagaru was sitting in a hall surrounded by large number of devotees. He was addressing the audience and was saying few words, but since there was no mike I could hardly hear. I got a seat far away from him, so I couldn't hear at all. I was trying hard to pay attention to his words, but unfortunately I couldn't hear anything. After all my attempts, slowly tears dropped from my eyes that I was unable to listen to his beautiful sweet and nectar like words. After few minutes, we had to disperse, we all got up. 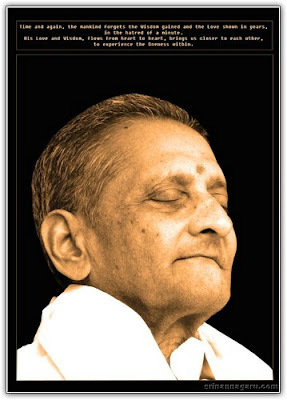 All devotees gave way to Guruji. All devotees were waiting for his glance on us. It is said "One look is enough,One touch is enough of Guru". I was waiting for the auspicious moment. Without disappointing any devotee, he generally looks into every devotee. I could see he was just few steps away from me. Finally, he slowly moved his eyes onto me, smiled and asked "Did you come from hyderabad?" The next moment all my tears were transformed to joy and happiness. I slowly followed him to his car. There comes the moment where there was no limit for my happiness, joy in my heart, such is his compassion. I had no words. After his sermon, Nannagaru had to leave from Sankar Matam, but unusually he dint leave. I felt like he was waiting for someone. He was going through some books in the book shop near vedam school. We all were waiting for him. He was talking to the devotees surrounded by him. A small boy who is hardly 8 years , came out of the crowd and was paying obeisance(Namaskar) to Nannagaru. Guruji smiled innocently and made him stand beside him. He also told the photographer to take a snap. The small boy came to join the school on the same day. 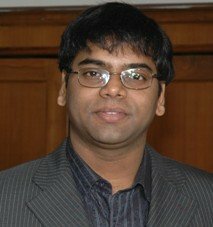 He was looking like young sankaracharya. The boy was dresssed up in orange color dress. He came to offer prostrations to guru, as his mother told him to do so. It was the first time they came to visit Nannagaru. A vedam pandit told her that a holy man came to visit our school, please go and take his blessings. So she told her son to go and take his blessings. The boy's mother was very sad, worried about her son as he is going to leave him in Vedam school. She was crying. The boy's father dint come to give send off to his son because it would be hard to depart his son, so he sent his son with the mother. She was crying while explaining these things to Nanangaru. Nannagaru said - "You don't have to worry about your son, he will also not worry thinking about you'll, he will stay happy in this school. The education that we get from this school is very good, and it is better than normal education from any other school. The boy's mother and other devotees also had tears." 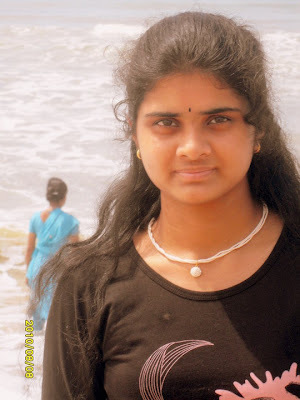 Nannagaru gave her some money and also gave some money to the boy and said "Whenever I come to srisailam, I will meet this boy". No words for his grace. The same day after some time in the evening, the boy's mother came to Nannagaru with her younger son(she left her elder son in vedam school). By knowing Nannagaru was in kshatriya ashramam, she came to visit Nannagaru. We could see joy and happiness on her face. The love that we get from the guru is unexplained, it has to be experienced. The grace and compassion that he has on us bought tears to the devotees. Nannagaru shared her sadness and tears with other devotees. Habits, tendencies, attachment-they trouble you, they cannot be removed by your effort, however-much you try, the seed will remain, only Guru(saint) can remove them along with the seed, that seed the Guru (saint) will burn it into ashes at the time of death and that will be the final death, no more re-births. That grace will follow you till the Artificial, False I is uprooted from you. God, Guru saint remembers you whether you remember Him or not, in fact He makes you remember Him and never to forget Him. God Himself states in the Bhagwadh Gita that He Himself is Remembrance and forgetness too. Palani Swami used to be like a shadow of Ramana. He used to be always with bhagavan. He is a great dispassionate saint. It is hard to attain victory over God's Maya. When it was four days before death he suffered with high fever. Some devotees brought mangoes for him and gave it to him. He loves mangoes. He dint put them aside, but he cleaned the mango and was ready to eat. At the same time, Ramanaswamy arrived. Being a big saint by himself, after seeing Ramanaswamy, he hid the mango. Bhagavan was acting like as if he doesn't know anything. He sat beside Palaniswamy and asked how is your fever etc., and then said I can smell mango here. Palaniswamy lied and said "There isn't a mango here". The desire to eat mango made him to lie. Bhagavan said - "you are saying there is no mango, then how can I smell mango here?” He went to the place where he hid mango, and took the mango and sat in front of him. Without giving a piece to Palaniswamy, he ate the entire mango and thrown away the seed. If we say don’t eat, it dint seem like he would stop eating, hence Bhagavan ate full mango and left, that is 'Guru'. He will look into your weaknesses that are troubling you, he will remove them and at last with his hands he gave Moksha. 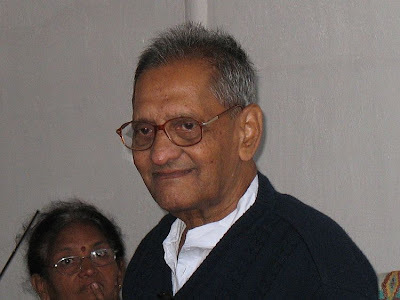 Sri Nanna Garu , came to London twice some years ago. Dr. Sri Raju accompanied him as his interpreter and travelling companion. 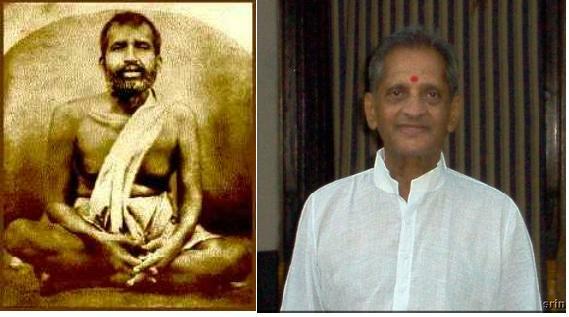 Nanna Garu made a great impression on the Members of the Ramana Maharshi Foundation UK who had invited him. On both visits he was open to meeting people individually for Darshan and when groups came he held them in silence for hours by the intense power of his gaze. many were deeply affected. At the Satsangs, his first attracted 90 people, he answered questions precisely and humourously. We had two retreats which were also very successful and were well attended.He visited the Houses of Parliament and 10 Downing Street from the outside, and gazed at them intensely. He went to Chichester Cathedral to meet the Bishop and also to Stratford on Avon to see Shakespeare's birthplace. He read the Times Newspaper daily. 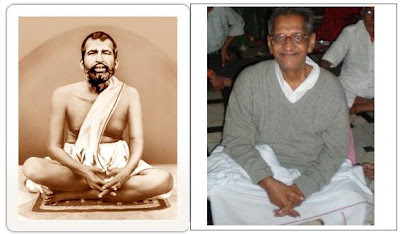 He always stressed that he was simply a humble Devotee of Sri Bhagavan Ramana Maharshi his Sat-Guru. Having visited us twice he thought it was sufficient, and said he hoped to visit the USA in due course. His visit to England was truly memorable and many of our members still praise him for giving him their first taste of a Guru's Gaze bringing Silence and an intimation of their Real Self into their lives.He is a truly a great Devotee of Ramana and now the Sat-Guru for many thousands. Two years ago in Tiru I was there when he visited and we spoke together sitting on a wall by Lakshmi's Samahdi. He asked me if I was happy, and I said yes. He calls me Gentle Jacob for some reason. We all love him. Except God everything is Maya (illusion), created by the mind. Against God's will where can your mind stand? Learn to compromise with God. Control over diet is essential. Wavering of the mind produces unrest dualities-likes, dislikes etc. Will you go on enjoying till you die? Doesn't your body and mind have any other work than enjoyments? 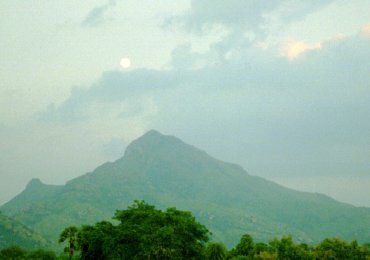 While extolling the spiritual efficacy of pradakshina, Sri Bhagavan sometimes used to narrate the story of King Vajrangada Pandya, which is told in the Arunachala Mahatmyam. Vajrangada Pandya was a powerful monarch who ruled over most of South India, but one day he was told by some celestial beings that in this previous birth he had been Indra, the ruler of heaven, and that if he worshipped Arunachala he could regain his former position. On hearing this, he at once renounced his kingdom and, with the intense desire to become Indra, he began to worship Arunachala by going around the Hill three times a day. After three years of such worship, Lord Siva appeared before him and offered him any boon he wished to pray for. Though his original ambition had been to become Indra, his mind had been matured by doing so many pradakshinas, that he now realized that it was worthless to pray for such a transitory pleasure. Therefore he prayed to Lord Siva for the eternal happiness of Self-knowledge. This story thus aptly illustrates that even if a person begins to do pradakshina for the fulfillment of worldly desires his mind will in time be matured and he will gain proper discrimination (viveka), desirelessness (vairagya) and love for Self (swatma-bhakti). Finally the magnificent eyes turned to me and looked at me with all vigor. I was chanting the name of Sri Ramakrishna and was looking at them. Finally the great guru heaved a sigh and opened his eyes and did namaskaar to me and others and got up. Crisis!!! I couldnt get up! I was not able to sit down for long hours of time and my feet had gone to sleep. I got up with difficulty and my feet shivered and I was trying not to embarass myself by falling. "It looks like you should not sit for long hours of time " remarked the Guru with a smile. I nodded but I was at a loss to understand why my feet and back shivered soo much with weakness. I had never felt like that after sitting only for probably twenty minutes. I wondered whether it was an aftermath of the vision that Nanna had bestowed upon me. The Guru slowly moved forward and said something that I dont remember. I also answered something that which I dont remember. After that I made courage and asked him suddenly " Nanna what should one do to develop pure love for God?" He did not hear me properly. Dr Usha told my question in his ears. He smiled a wonderful smile and his lips quivered with ecstasy. "That will take an hour long sermon Mithin " he said. He looked again deeply into my eyes. This is the test, I thought. Did he see my innermost desire? For within seconds he uttered the most beautiful words in the Universe. "Ramakrishna said first God and then service..." he said "first it is always God, then only service. Repeat it" he told me. "First God and then service" I said. I said " Nanna you and Ramakrishna are the same." Dr Usha told what I said into his ears. This was said in a very humorous way and had all the people around in splits. I am sorry I have to end the note here. A lot of conversation, mirth and joy transpired after this which I feel cannot be covered by my vocabulary. Nanna talked about true love, Vivekananda , Adbhutananda and Guru's grace. He talked all of this standing and with his hand on my shoulder looking deeply into my eyes. I could write all that but my wretched mind is not worthy to describe Him and his beauty. I feel like banging my head against the wall because I have no power to describe the beauty of Nanna and his stunning words filled with laughter and joy that day. I feel I a might end up painting a wrong picture of Him. I would like to tell my friends that if you see something divine and beautiful in these experiences it is because of my guru only...all things wrong, boastful, egocentric and incomplete are due to me alone. I am just a restless mind trying to paint the picture of No Mind All Heart...I always can go wrong! Please forgive me for any such. Know this that his gist on that day was " Guru's grace...guru's grace will give all." When you have insight, any evil Karma(accumulated actions), grief, sorrow will not touch you, even death will not touch you. When there is no sorrower, where is sorrow then? In this body itself you will get peace, if you want peace and happiness, Forget the past and do not flunk about the unseen future. Do not worry. Live in the present. Do perform your duty daily. Do not imagine the future. For gaining knowledge, you need not stop your allotted duty and need not escape from your family duties. There is no need for imitation or comparison with others. You do not think about what others think about you. It is waste and unnecessary. We are 100% fearful if we think about others and their thoughts. Inspite of having all worldly possession? if you are still getting fear, unrest, what is the use of these then? Recently a friend of mine who is instrumental in awakening devotion in me for my guru had said " Try to spend as much time with the sadguru" This thought remained uppermost in my mind. I previously used to be scared to approach the guru becoz I felt scared that he will see all the bad qualities I have and I will be left ashamed. 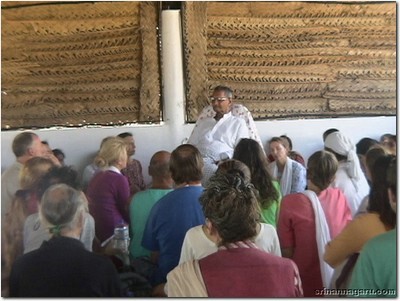 But I decided otherwise and made preps to meet the guru following my friend's advise. I messaged Dr Usha yesterday night asking her whether I could have Nanna's darshan today morning at 6.00 am before he leaves for Sri Sailam. Having got a confirmation I got up at 4.30 am , got ready and started towards SR Nagar flat where the guru was put up. On the way the radio was playing 'Guru Brahma' chant. Apt, I thought, very apt. I reached the guru's place at 6.00 am sharp and was a little sad that I couldnt get anything for him like fruits etc. I went up and by that time itself a few devotees had gathered around the empty chair where he was supposed to sit. I saw him in the room yonder and went towards it and entered it and made pranams to him. "Ah Mithin, come" he said. I went in and offered my pranams and tried to sit down. He refused vehemently and asked me to sit up. "But I want to sit at your feet " I protested. "If your shirt is tucked in it is better for you to sit up" was his mysterious reply. He then embarked to ask me about my practice and his minor health problems. I gave him sufficiently satisfying answers. A few devotees came and talked and left after pranams. A lady devotee came and offered me coffee along with Nanna. I was too shy to take. Nanna began to sip on the hot coffee. I blurted out to Nanna that I had seen him in a dream sometime back. "Was it yesterday night or a few nights ago?" he asked. "A few nights ago" I said. "I saw a three headed woman come and do seva to you." He looked at me for a second and smiled and then changed the subject. His demeanour showed that I just gave a confirmation to him about a diagnosis he had already reached about me. "I have to go and sit with the people there for sometime. We will talk later " he said. I went back to the hall. I REMOVED MY TUCKED IN SHIRT AND LEFT IT FREE. (LOL) and sat down on the ground. A lady devotee asked me to come and sit in front of Nanna's chair instead of sitting far away. I thanked her and came and sat in front of the guru's chair. He slowly came and sat down in the chair. First he looked across the hall and at me and then closed his eyes. His attender came and gave massage to his feet for a good ten minutes with oil and then stopped. There was a pin drop silence all around. I offered him a 'hi' from my friend mentally. His forehead wrinkled a bit and then stretched out peacefully. I then started to bombard him mentally with waves. The prayer went something like this " I am a bad person with no good qualities. I am filled with everything that is despicable. I have no devotion to your feet, nor love for the divine. I have seen my friend who is full of your devotion. kindly forgive my faults and give me devotion like that "
I had not even finished the prayer than he suddenly opened his eyes and looked at me with piercing looks. I did not know whether I died or was born in that moment. It was soooo surreal. And then he closed his eyes. He suddenly opened his eyes again and looked at me for a long time. Oops, he is seeing, I thought...all my births...all my sins....all my badness...everything he was seeing I thought. And suddenly it hit me. I was not afraid anymore. I urged him to see more. See, see and heal...I pleaded mentally. The fear was gone. I opened my eyes wider. See, I said. I felt purified...happy and like a new born. There was a man who knew more about me than I knew about myself, I thought. Next I decided to bombard Nanna with another plea. "SHOW ME YOUR TRUE FORM O GREAT GURU" I said mentally. I did not know when it happened. But something astonishing and ego shattering experience happened. But instead of his eyelids I saw two huge eyes!!!! They were more powerful....more deep than his regular eyes. They were exactly like the eyes of Sri Ramakrishna! I thought it was a hallucination. I looked at the other devotees. But when I looked back at him...two magnificent pair of eyes were looking at me and the devotees. They were three times larger than the normal eyes and were slanted like how a deity eyes should be. I wondered again whether it was a hallucination when the eyes blinked!!! Nanna was looking at me even though his eyes were closed. He looked like Ganesha, like Sri Ramakrishna....like Durga. It was very very awe inspiring to see such eyes. I have never seen such eyes. And then suddenly he opened his eyes and I could see his regular eyes. He closed them again and the large pair of eyes came up in the place where the eyelids should have been there. I knew immediately...I am with God. Only God can have such eyes...Kamalanayana Krishna! Friends it is beyond the scope of my limited vocabulary to describe the power, love and seriousness in those eyes. I have never seen anything more beautiful...anything more scary...anything more divine than those divine pair of eyes which didnt seem to exist. Those eyes were studying everyone...each one was being bombarded by grace. imagine this once again...when someone closes his eyes...we see his eyelids...but here there were no eyelids...there were two huger pair of eyes...slanting like a deity and deeper than the deepest ocean possible. Reduce wandering and attachment it is Sadhana (spiritual practice). Knowledge and devotion are combined, they cannot be separated as sugar in coffee cannot be separated. Be very careful while forming habits for Habits Die Hard. Do not get identified with anything. Conduct, Behavior should be good and proper. It is not enough if you possess good thoughts, they should be activated. Oh! Shiva (God), Give me Teach me inner-sight, then! I will and I can find you, see you. As the rat falls into the rat-trap by getting attracted to it only by a small piece of flesh, so also we are falling trap into the external attractions and enjoyments which is nothing but MAYA(illusion).